Does a musical genre exist called 'Industrial Shoegaze?' Because that would be the perfect classification for Brooklyn band A Place to Bury Strangers. Having earned themselves the unofficial title of "the loudest band in New York," if you like your rock with noisy guitars and that distorted garage band quality, you are gonna love these guys. Having said that, don't get confused, they are not your ordinary, run-of-the-mill dive bar playing, guitar thrashing novices. On the contrary, A Place to Bury Strangers has developed a real refinement and genius to their noise and distortion. Especially going into their sophomore album, Exploding Heads due for release on October 6th, which is shaping up to be a must have for all rock enthusiasts. 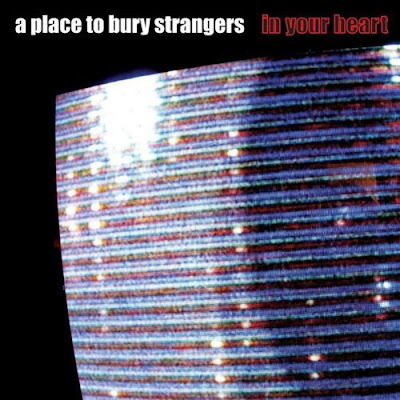 The first single off their upcoming LP, In Your Heart, for which they just released a brand new video, provides a solid example of their powerful 'wall of sound' instrumentation nicely framing their, dare I say, Joy Division-esque vocals. this is amazing too! joy division & new order type day.